Ahead of December 9 release. 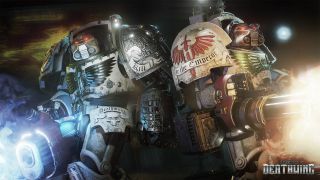 Space Hulk: Deathwing is finally nearly here, and while we wait for the stompy Warhammer 40K FPS to release on December 9, we can at least watch some footage from the single-player campaign, to get an idea of what lies in store. What's in store then? Noise, alien shootin', and lots of nifty environments that mix sci-fi steel with gothic bricks and pillars—which is kinda what we want from a Space Hulk game, right? Stick this on full-screen, play along by putting your hands on the mouse and keyboard, then feel a bit silly for doing that last bit. You can pre-order Deathwing on Steam for 15% off, and for a chance to play the beta in a couple of days—but then what if it's rubbish, and you've just wasted £25 on a dud? Probably best to wait a bit, until you can read or watch or listen to some impressions/reviews of the game.